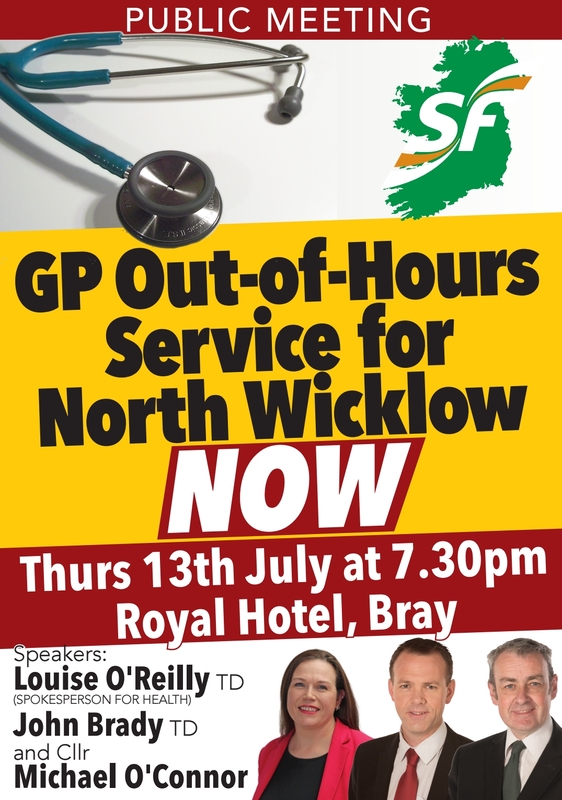 Sinn Féin TD for Wicklow and East Carlow John Brady will host a public meeting next Thursday evening July 13th calling for a GP Out-of-Hours service to be delivered for the people of North Wicklow. 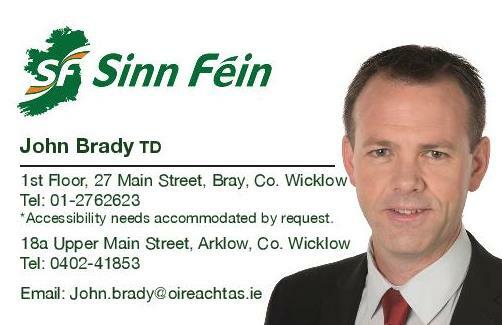 The public meeting will take place in the Royal Hotel, Bray at 7.30pm. Speakers on the night will include John Brady TD, Cllr Michael O’Connor and Sinn Féin Health Spokesperson Louise O’Reilly TD. 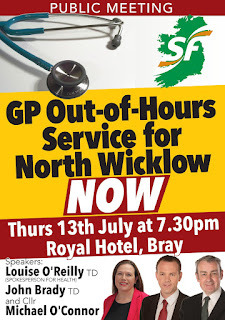 “A GP Out-of-Hours Service for North Wicklow was due to come into operation last February as committed to by the Minister for Health Simon Harris. “Last month, we learned that not only have the HSE shelved these plans but that the funding necessary to deliver this service was actually never in place in the first instance. “People should be able to access GP care out of normal working hours if and when they need to. This is an essential health care service and it is badly needed in North Wicklow. “The closure of the 24/7 Accident & Emergency Unit at St. Columcilles and the failure to deliver this GP out-of-hours service adds to Fine Gael’s record of health care in this County. safety auditing does more than just ensure compliance with the various acts and regulations governing occupational health and safety (OHS); it ensures that employees are kept healthy, injury-free and productive. For more information visit us on our www.safetyauditing.com.au Program or any of our other services.